The UFHCC Office of Community Outreach and Engagement attended the Library Partnership Health and Wellness Expo on Feb, 28, 2019. Dr. Sarah M. Szurek, Ph.D., and Joshua Chen pose with Rebecca Hightower, a Gainesville resident, at the Health and Wellness Expo. The Library Partnership Health and Wellness Expo, held annually and organized by the Partnership for Strong Families, aims to bring together agencies and organizations around Gainesville to raise awareness for health services. The UF Health Cancer Center Office of Community Outreach and Engagement (UFHCC COE) was invited to participate in this event. The UFHCC COE exists to promote community-engaged research and align the research goals of UFHCC programs with the needs of the communities it serves. COE Program Director Dr. Sarah Szurek and intern Joshua Chen promoted knowledge of colorectal cancer prevention, screening and treatment through an interactive quiz activity during the Health and Wellness Expo since March is National Colorectal Cancer Awareness Month. 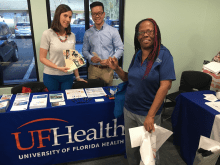 In addition, UFHCC COE provided other prevention materials and information on the programs and services that UF Health Cancer Center provides.